3 Big Clues to How Old is My Dog? How Can I Tell the Age of My Adopted Dog? The first question most people ask about your dog is what breed he is. The second question is how old is he? But when adopting a dog, we don’t always know the dog’s history. Dog rescues and humane societies are usually taking a guess based on certain physical appearances. It can be difficult to know how to tell how old a stray dog is. While you may never know your dog’s exact birth date, there are several physical attributes to look for that can give you a good estimate of how old your dog really is. If only our dogs could talk to us right? All of these vary based on your dog’s breed, nutrition, and his medical history. Our first foster dog, Silla, was an owner surrender, so we did know her age… she was 10 years old. The vet was actually shocked to learn how old Silla was because her teeth were still pearly white, very rare for a dog her age. 1. Check Your Dogs Teeth. By the time your dog is about 4 months old, his adult incisors, canines, and premolars should be coming in. When your dog is about 6 months old, all of his baby teeth should be gone. This is usually a very welcoming stage in a puppy’s growth, it means you are past those needle sharp teeth that like to mouth everything! If your puppy has any baby teeth left, he is most likely younger than 6 months old. 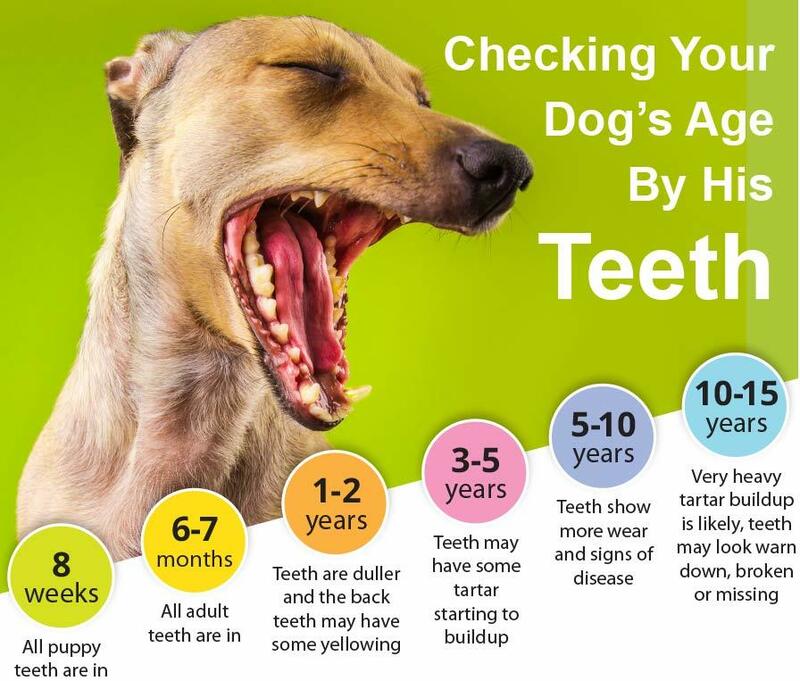 If you have adopted an adult dog, it is going to be more difficult to determine age by his teeth. But you can guess that the more plaque builds up, the older the dog is. If his teeth are pretty clean, my guess would be he is younger than 3 years old. The above photo is of a 3 year old yellow lab. 2. Is your dog turning grey? This one is pretty simple, just like humans; dogs can turn white or grey as they age. Usually, around 5 years old you will notice some graying around your dog’s face and muzzle. But greying is not always an accurate sign, as some dogs have been known to start graying as young as 2 years old. 3. Observe your dog’s eyes. Gaze into those big beautiful puppy eyes. This is something I never knew before, but as your dog ages, his eyes develop what they call, lenticular or nuclear sclerosis. It looks like a haze or grey film over the eye. And as your dog gets older, the gel inside the lens becomes thicker, hardened and changes color. This graying in they eyes usually start around 5 years old and becomes more prominent as the years pass. There is a great article on PetMD, Is it a Cataract or Lenticular Sclerosis? If you concerned at all about your dog’s eyes, I recommend taking him to the vet to have it checked out. So with these three clues, teeth, coat and eyes, you can get a good estimate of how old your dog really is. But you also need to consider the breed of your dog. Larger dog’s age quicker than small dogs. Does age really matter? It is just a number, right? So now you have an idea how old your dog is in dog years, you may be wondering how old is my dog in human years? How long is a dog year anyway? I found it interesting that the common theory of 1 human year equals 7 dog years is actually not true! Really, I believed this my entire life until today! Now that we have dog years explained clearly, enjoy every day, every month and every year you have with your dog. Time passes so quickly! Keeping your dog happy and healthy is the most important part of your life together. Feed him a high-quality food, bring him to the vet for yearly checkups, and give him plenty of exercise and love. P.S. If you haven’t downloaded our free Dog Health Record printable yet do it NOW! How Do I Get My Puppy to Stop Nipping or Biting Me? Never Forget Another Appointment, Medication, or Vaccine Again! You can easily keep track of vaccinations, illnesses, dates and more with the Dog Health Record PDF! ​Just as you keep records of your kids medical history, we need to do the same for our dogs. This information could save your dogs life some day! Keep track of vaccinations, illness, reactions, dates and more.